Celebrity Autograph shows are becoming a gathering place for Pop Culture. After all, the movies and television shows are our history in relating to the 50's and 60's, etc. Of course, music is also a main driving force in my generation. So, my own personal experience being a post-World War II baby touches on all these genres. My peers and their children, as well as their grand-children, all relate to the Beatles! Certainly Batman, The Monkees and Dr Pepper have all prevailed. Even Frankie and Annette have taken their royal positions in the Tapestry of Life in America. It's an America that reminds us of who we want to be. So, in gathering and meeting all of you at the recent Hollywood Show in Burbank, especially those who took the time to travel, I thank you for visiting and sharing yourselves with me. To my NJ fan, Matt, a man who had the support of his wife and kids to make the journey west and spend two days at the Expo, I say hi-five! 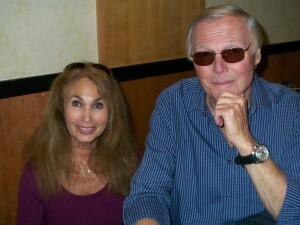 To Mike and Steffie from Northern California, it was a joy to spend time with you. And to all of you lovers of life, I send my love and hope to once again be together. For those of you on the East Coast, I will be in New Jersey at the NJ Comic Expo on November 12th and 13th. Good Gravy Donna !! Glad to see that your still lighting up all our lives !!! Oh! Donna, you both looked really great in the picture with Frankie smiling together. You two music romancers are the quintessential singing serenaders of the sixties. Love to see you both perform in Las Vegas singing Sinatra and great sixties favorites. As a duet you two would be a great Las Vegas sensation like Donnie and Marie. Great to see you again with Adam West, Batman from the original sixties TV series. Have a really great Batman Comic Show in Teaneck, NJ on Nov 12 & 13, 2011. You and Frankie really look great together again !!! Come on everybody we’re gonna have a beach party tonight !!!! WOW ! Susie !! You’re a real Sweetie !!! Susie, now that, is a really pretty yellow dress. “Love Is A Many Splendored Thing” 1955.